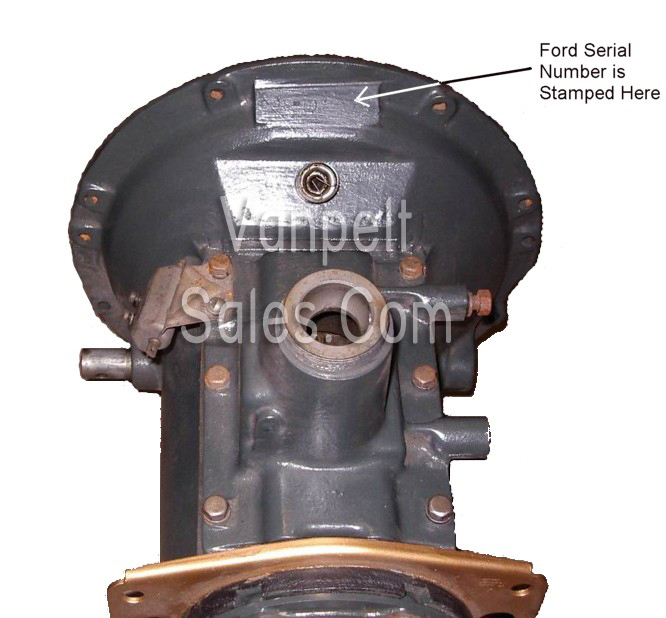 (a) The serialization applied to passenger cars, trucks, and commercial vehicles using these Ford engines. They may have different serial prefixes, but would be inclusive within the serial ranges shown. In other words, passenger car totals must be combined with truck and commercial vehicles to arrive at total usage of the engine production numbers shown. The letter in the prefix indicates the type of vehicle: A = Passenger Car, C = Commercial Vehicle (pickup truck or panel/delivery truck), and T = Truck (large trucks of 1 ton rating or bigger). The number in the prefix indicates the engine type: 18 = regular 85hp V8, 99 = 95hp V8, 54 = 60hp V8. The letter G or H in the prefix indicates the six cylinder engine. (b) The serial numbers were stamped on the vehicles without any commas or superfluous 0's (zeros). They have been shown here to help identify the general starting number. For instance, the first 1939 Mercury would have a "99-1" stamped as its serial number (rather than 99-001as shown above). (c) Ford changed production on October 3, 1947 from the G series to the new H series six cylinder engine. They started new serial numbers for the new engine. (d) The available records do not show the beginning number for 1939 models with the 60hp V8 engine. According to the Early Ford V8 Club 1938-39 Ford reference book, Ford held up production of the 60hp engine for awhile due to overstock. They stopped building the engine at #54-468,967 on December 23, 1937 and did not resume production until April 20, 1939 with #54-476,288. "The Standard Catalog of Ford 1903-2003" gives production numbers of 38,197 coupes, 124,866 Tudors, unknown # of Fordors, and 3,277 Station Wagons with the 60hp V8 engines. No data for trucks and commercial vehicles with 60hp V8's is given, so the total number for 1939 is unknown. (e) According to the same EFV8 Club reference book, the first model year 1939 production V8 (85hp) was #18-4,657,660 which was built Sept. 6, 1938. This conflicts with the "first" number listed above (a difference of 3,341 units). (f) In the 1938 model year Ford changed from the 21 stud 85hp V8 to the 24 stud engine. The change occurred with #18-4,380,120 on November 24, 1937. (g) Per "The Standard Catalog of Ford 1903-2003" total production of 1940 passenger vehicles with the 60hp V8 is 231,425 units (including coupes, Tudors, Fordors, & station wagons). This does not include additional totals of 60hp engines used in trucks and commercial vehicles. (h) For more complete Data Plate decoding information on 1949 thru 1953 Ford cars, refer to the decoding chart. Additional letters between the beginning two digits (letter/number) and the rest of the serial number indicate the assembly plant location. Refer to the decoding chart. (i) Letter from the Ford Motor Company to all Ford offices (dated Nov. 4, 1947): "Engine and model numbers for 1948 (Ford) cars - the lowest number used with 1948 prefixes for six-cylinder passenger car engines is 87HA-0536. Lowest number used with 1948 prefixes for V-8 passenger car engines is 899A-1984859. Due to inventory of engines at various assembly plants, some 1947 models will have higher numbers than the above. However, the prefix changes will definitely identify the 1948 models from the 1947 models." The serial numbering shown in the chart above reflects this numbering variance. (j) On 1950 thru 1953 models (and beyond) any additional letters between the basic model letters and serial numbers denote the assembly plant. For Data Plate decode information, click here. (k) Production on L-Z prior to January 10, 1946 used the 1942 engines. 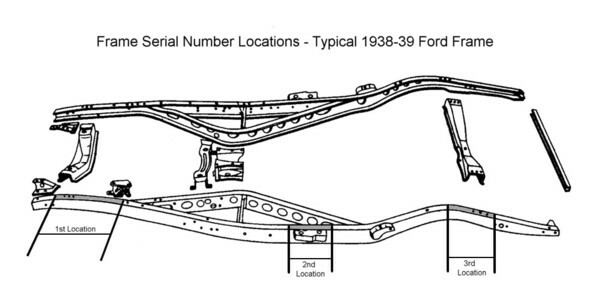 Other: From 1932 through 1948 vehicles, Ford Motor Company stamped the serial number into the top of the driver's side frame rail in three locations. This same number was also stamped into the top of the transmission-to-engine housing portion of the transmission. This location was visible when the floorboard and transmission cover plate were removed (click here for a picture example). Of the frame-stamped serial numbers, only the forward-most stamping was visible when looking down into the engine compartment (located between the front crossmember and the dash (firewall). The two other frame locations are visible only when the body is removed from the frame. The serial numbers were metal stamped with numbers/letters approximately 1/4" in height. The number (including the prefixes shown) was always preceded by (and followed by) a stamped "star" similar to an asterisk. It is believed that this was done to prevent someone from fraudulently adding a digit to the beginning or ending of a serial number in order to alter its identification. From the Ford Service Bulletins there is a bulletin dated April 15, 1938 that refers to "Engine Numbers". The subject covers the use of the correct stamps when reconditioned cylinder assemblies are stamped by dealers. The bulletin goes on to say that the dealers should use the K.R. Wilson number A404B stamp set. The 1940 K.R. Wilson tool catalog shows the A404B stamp set of 11 stamps (numbers 0 thru 9 plus the "star"). The same catalog shows a new number A404 stamp set of three (just the 6 stamp, the 9 stamp, and the I stamp). The K.R. Wilson catalog states that "The design of engine numbers has been changed to lessen the possibility of outside individuals attempting to change engine numbers. The figures I-6-9 have been changed. Dealers should immediately provide themselves with the new figures - One-Six-Nine. See Ford Service Bulletin, Subject No. 6000 (Engine) Page 22." The diagram above is from the 1940 K.R. Wilson Catalog of Service Tools & Garage Equipment, and was included with the notes about the change in stamps. The primary differences were the numbers 6 and 9, and the number 1 becoming more like a capital "i" in appearance. On 1949 cars had a metal tag riveted to the firewall on the right (passenger side) side, very close to the right hood hinge. The serial number was also stamped into the right-front frame rail, just back of the radiator support. On 1950 cars the number was stamped on the dash panel (firewall) under the hood, just below the cowl, in fairly large digits. Also, in some assembly plants, the 49 style VIN tag was also riveted in the same as the 1949 cars. In 1951 the number was stamped in a plate which was mounted on the dash panel (firewall) under the hood. For 1952 and 53 models the number was on a plate mounted on the right front door pillar post (below the upper hinge opening). The 1954 through '59 models (except '55 T-Bird) had the number on a plate on the left front door pillar post. Resources: The information given in this chart is based on the data given in "MOTOR'S AUTO REPAIR MANUAL". Two versions were referenced: the 1935 to 48 book and the 1946 to 56 book. Also, "The 1938-39 Ford Book" published by the Early Ford V8 Club of America. Also, "The Standard Catalog of Ford 1903-2003" published by Krause Publications. Also, the reprinted "Ford V-8 Service Bulletins (1938-1940 Complete)" published by Post Motor Books. Also, the K. R. Wilson 1940 Catalog of Service Tools and Garage Equipment. We have found some conflicting information on serial numbers (surprised?) but have generally used the data from the Early Ford V8 Club Album when statistics from other sources was different. Caveat! In reviewing the various source of serial number information (and we have not even researched them all) we find that there are some discrepancies. Sometimes, the Ford record keeping was not entirely correct. Some serial numbers within a sequence were simply never assigned to a vehicle. Other details that don't make sense prevent us some assuming 100% reliability in these statistics. As confirmed details become available to us, we will add reference notes or make corrections as necessary. For more information on Patent Plate Decoding click on this sample plate below or click here. For more information on Patent Plate Decoding click on this sample plate above or click here.